Located in the heart of lively Ayia Napa, the Olympic Lagoon Resort is one of the best places to enjoy a luxury holiday in Cyprus. The award-winning hotel offers luxury facilities, including themed swimming pools, a whirlpool, Health Club and Spa with yoga, aerobics and Zumba available – plus a plethora of daytime activities organised by the friendly hotel staff. The Landa beach is the closest, at only 3km away from the hotel – making it an ideal spot for a sunny day spent on the sand. 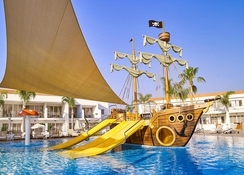 The beachfront Olympic Lagoon Resort Paphos offers five fantastic outdoor pools guests can make a splash in, plus an excellent entertainment programme complete with kids’ and teens’ clubs, to keep younger visitors occupied. The dining scene at the hotel is superb, with a total of six restaurants and five bars to indulge in, whether you fancy an a la carte meal or cool cocktail lounge. The hotel’s 276 rooms are spread across four floors, and are comfortable, airy, with a contemporary finish - each housing relevant amenities for guests to enjoy a 5-star stay. The Olympic Lagoon Resort is located in the heart of Paphos and it can be found in one of the best locations in the area, lining the gorgeous Blue Flag beach. The city centre is only minutes away, with Paphos Harbour 2km away and Paphos Old Town 4km away, plus a line-up of shops, bars and restaurant 50, from the hotel. Nearby famous attractions include the Panagia Chrysopolitissa Church and Saint Paul’s pillar. Some of the best beaches of Cyprus, including Konnos Bay, Makronissos beach and the Landa beach are super close too. At the Olympic Lagoon Resort, all 276 rooms are decorated in a modern fashion. 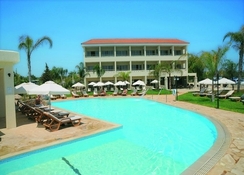 Each room comes with a spectacular view of the sea, the gardens, the pool and the countryside. The rooms in this hotel are categorised, with a Deluxe Room, Superior Rooms, Fishermans Village Rooms, Family Junior Suites, plus options for sea view, pool view and private terraces – catering to all guests. The rooms have air conditioning, 32-inch television, telephone, mini fridge, hairdryer, in-room safe and tea and coffee making facilities. All the rooms have Wi-Fi connectivity too. There is a delectable dining scene at the Olympic Lagoon Resort Paphos, with a total of six spectacular restaurants and five bars to relax in – all of which are open to guests in the all inclusive package. The Royal Olympic Restaurant serves International buffet-style cuisine, while the cosy Captains Deck Restaurant serves traditional Cypriot delicacies including meze platters. Rock n Roll is fantastic for great American food, and has a la carte menu with specialities. Seven Orchids Pan Asian Restaurant serves delicious sushi and Teppanyaki, while you can get Italian dishes at Garibaldi Ristorante Italiano and other classics at The Greats – a new concept at the hotel. Snackeria serves hot and cold beverages while Blue Lagoon, Grand Lobby and Terrace, Serenity and the Xperience arena bars serve cocktails, drinks and snacks. There is also a bar named You & Me, which is exclusively for adults. 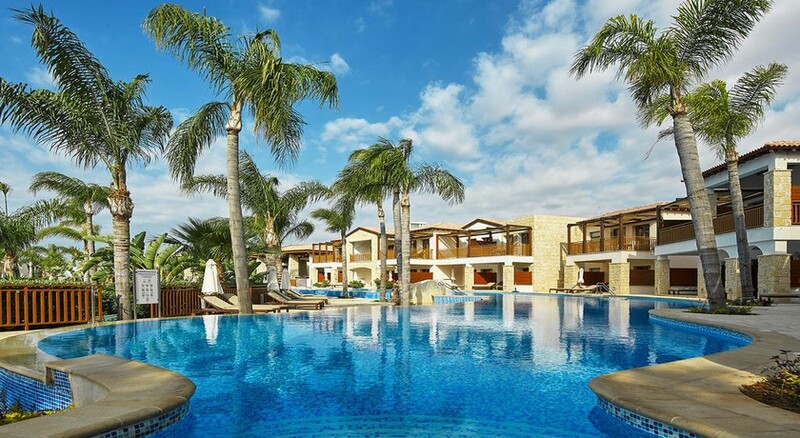 There are ample sports, games and entertainment facilities at the Olympic Lagoon Resort Cyprus including five themed swimming pools, Blue Lagoons, the Mayan Temple, Serenity Oasis, Serenity Health Club and Spa, and The Little Monsters. Guests who want to relax and unwind can spend time in the Health Club and Spa at the hotel. An extensive entertainment programme is organised by the hotel, including spectacular shows, live music and more. The hotel accepts American Express, Master Card and VISA. We attended a wedding. Had a lovely time. Couldn't fault the complex, staff or food.